Brett Krull (Autonomous Materials Systems), Jackie Rankin (Bioimaging Science and Technology), Chad Webb (3D Micro- and Nanosystems) will present on September 17 at noon in Beckman room 1005 as part of the Graduate Student Seminars. Lunch will be served. Biological tissues possess the ability to heal in response to damage and some organisms can even regenerate entire structures lost through catastrophic injury. 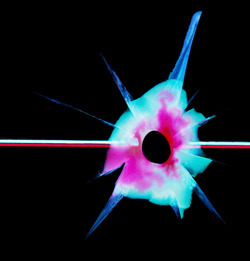 Although self-healing has been achieved in synthetic materials using embedded microvascular networks, healing is limited to relatively small (microscopic) defects and cracks. Damage that involves significant mass loss such as ballistic impact represents a technological challenge that has been unachievable to date. Liquid healing agents are susceptible to bleed-out due to forces imposed by surface tension and gravity. Here we demonstrate the first synthetic system that regenerates in response to large scale damage. A two-stage polymer chemistry provides a technique to mitigate bleed-out and restore system performance through the use of two distinct rheological transitions. Following in situ microvascular delivery, healing agents rapidly gel to aid in fluid retention and later transition into a robust, structural solid. By control of reaction kinetics and delivery rate, we are able to regenerate impacted regions that exceed 35 mm in diameter. Damage-triggered regeneration will lead to synthetic materials systems capable of vastly extended life, damage tolerance, and safety. Silicone polymers are abundant in modern technology; there are surprisingly few reports, however, of micron sized spherical particles (microspheres) composed of polydimethylsiloxane (PDMS) or other silicones. This is due to the high viscosity and low surface energy of silicone oligomers, which cause coalescence and aggregation during emulsion polymerizations. Ultrasonic spray pyrolysis (USP) is a one-step, continuous, aerosol process that has previously been utilized in our lab to make a variety of silica, carbon, and metal oxide microspheres. In this work, we report a generalizable, facile synthesis of PDMS microspheres using USP. 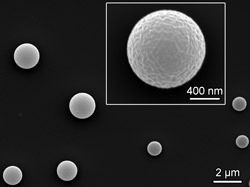 We are able to produce crosslinked, stable PDMS microspheres with diameters of ~1 μm, more than a factor of ten smaller than PDMS microspheres reported in the literature; in USP each micron-sized droplet acts as an isolated reaction vessel, reducing the probability of coalescence and aggregation as the polymerization proceeds. This synthetic method is capable of producing magnetic and fluorescent PDMS microspheres, as well as microspheres composed of other silicones (e.g., polydiphenylsiloxane). These silicone microspheres exhibit low cytotoxicity, are taken up by cells, and have potential as materials for biological imaging and tracing, drug delivery, and extended drug release. Measurements of the physical properties of human skin provide information that is essential to understanding dermatological health and associated aspects of human physiology. Noninvasive, in vivo evaluation outside of clinical setting yields the most valuable data of this type, but precise measurements are limited by the mechanical mismatch between rigid electronics and soft, living tissue. This talk will present ultrathin, conformal systems of electronic sensors and actuators that laminate softly onto human skin. A focus is placed on sensor systems that exploit precision heating and thermal mapping of skin to gain deeper insights into overall health and wellness, while remaining beneath the notice of the user. 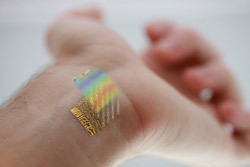 Translation from lab to clinical healthcare studies provide validation for practical use at the point of care, while engineering design strategies, quantitative models, and experimental validation provide a framework for advances in a wide array of flexible, stretchable electronics.